1. For the chocolate mousse, place the chocolate in a heatproof bowl set over a pan of simmering water and allow to melt, stirring occasionally; cool. Meanwhile, using electric beaters, whisk the egg whites in a clean bowl until stiff. Sprinkle over the caster sugar and whisk for another minute until glossy. Gently fold the egg whites into the chocolate until just combined, then whisk briefly at the lowest speed until smooth. Divide between 4 glasses and chill until ready to serve. 2. Next make the poached rhubarb. Place the fruit in a pan with the sugar and 3 tbsp water. Bring to the boil, then simmer gently for 5 minutes. Cool until ready to serve. 3. To make the ginger honeycomb, grease a non-stick baking tray with a little butter. Put the sugar, golden syrup and ginger in a pan, stir to combine, then place over a low heat. Once the sugar has dissolved, increase the heat a little and simmer for 5 minutes without stirring. Add the bicarbonate of soda, take the pan off the heat and give it a good stir. The mixture will bubble up. Immediately pour onto the baking tray and allow to cool for about 30 minutes, then bash carefully into chunks with a rolling pin. 4. Just before you’re ready to serve, take the ice cream out of the freezer and leave to soften for 10 minutes. Whip the cream and sugar in a bowl until the cream forms soft peaks. Put a scoop of ice cream on the chocolate mousse, followed by some honeycomb chunks. 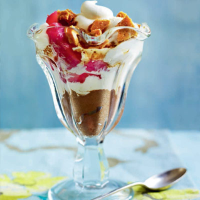 Spoon the rhubarb on top, followed by another scoop of ice cream. Top with cream and more chunks of honeycomb. Serve immediately.